AI Builder Express is a simple and intuitive application that instantly builds a neural network based on your imported training data. 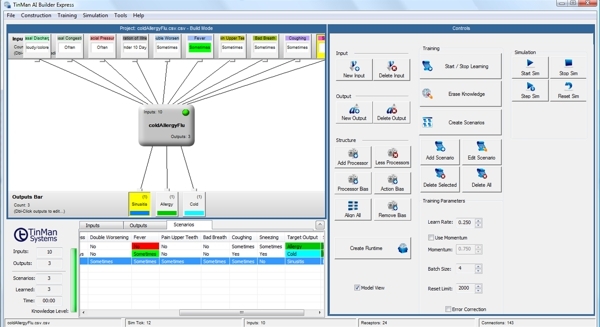 Various configuration controls allow adding additional processing power as well as direct manipulation of the learning algorithm parameters to optimize training. Use to learn, or use to export for integration to your application. 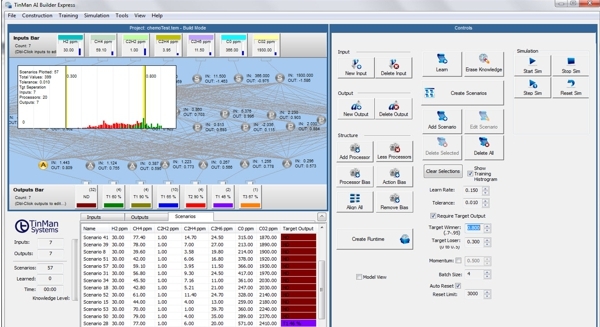 Import your data to automatically construct an artificial neural network with all requisite connections - data inputs, middle layer and output decisions. Train with a button click. Building, training, texting and deploying a custom neural network is a straight forward process when engaged as single steps. Follow the wizard screens to complete the process. 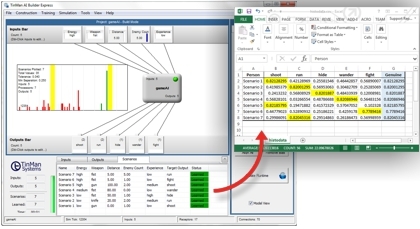 With large input sets, leverage the visual tuning and analytical feedback of the interface to assist in completing the training process. Color coding and tuning conventions greatly facilitate success. Take Express for a free spin. Download a 30-day trial and visually design something smart. If you are viewing from a mobile device - no problem - we will send a download link to your email. 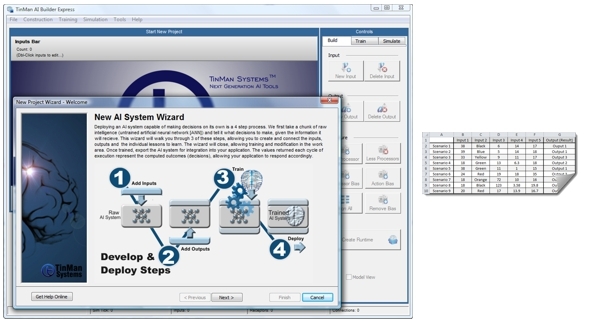 Intuitive user interface makes it easy to build, modify, train and experiment with a custom neural network. 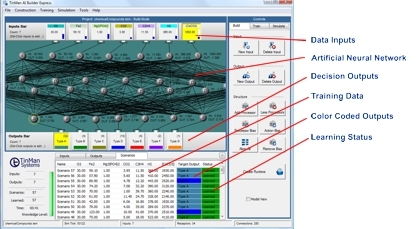 Use controls to navigate the training data and visually see resulting computed decision..
Once the neural network is trained, you can export the resulting training matrix which details the final output values for each of the feature vectors. Highlighting the winning identity/pattern by displaying all scores with winner at right..
TinMan Systems is the leading supplier of software and services in artificial intelligence and real-time sensor data fusion and visualization. @Copyright TinMan Systems, Inc. 2018 All rights reserved.